So . . . Tony's birthday was June 17th, which was also Father's Day, which should have meant it was an amazing double whammy day of awesomeness, except it wasn't. It was kind of ho-hum. We started out strong with breakfast, moved into church, then it was nap time, followed by dinner at my Dad's, before Tony went to softball. Such a snoozer, right? Tony didn't say a single grumpy word about the day, but it ate at me that it was so lackluster. I'd been thinking about declaring July 17th his "do over birthday" for a couple weeks, when my friend Rachel shot me a text asking if Tony would like a double bike carrier. What an amazing provision from God! Rachel had no idea that I'd been casually looking on craigslist for a few months! Her neighbor was throwing a virtually brand new carrier in the trash, all it needed was a $10 piece to connect it to the bike. With Rachel, her husband and I conspiring, we agreed to keep it a surprise from Tony and I now had a present to gift him on his "do over." Under guise of spending time with friends, I went to Rachel's house with the boys, so they could play with Rachel's daugthers, while Tony, Ben, Levi and Levi's friend Bryan went out for a drink to celebrate Levi buying a house [eeek!] and other life events. Remind me, often, 3 maybe, 4 never! AHHHHHH! Rachel and I barely contained the craziness of our 4 kiddos, but managed to laugh the majority of the time. As I left Rachel's I got all sorts of excited to give the trailer to Tony, so I decided there was no good reason to wait until today the official "do over" day. I was holding Isaac when Tony came outside and he excitedly told Tony to close his eyes while we opened the back hatch. With great zealous, Isaac told Tony to open his eyes and while it took a second for them to adjust in the dark, he was so thrilled to see the trailer! He didn't stop smiling and I was so thankful for a friend who would go on a salvage mission for me! Tonight we have grand plans to take the inaugural bike trip [ps:: I haven't ridden a bike in years and will be borrowing my Mom's] and then dropping the boys back off at my Mom's to grab dinner together. That's awesome! We have one and it was a garage sale find of my dads... We had to wait to really crank it out this summer until Coen had a helmet. Now that he has one, they've been out together 2 times and the second time wasn't such a hit. I think he needs a riding partner! 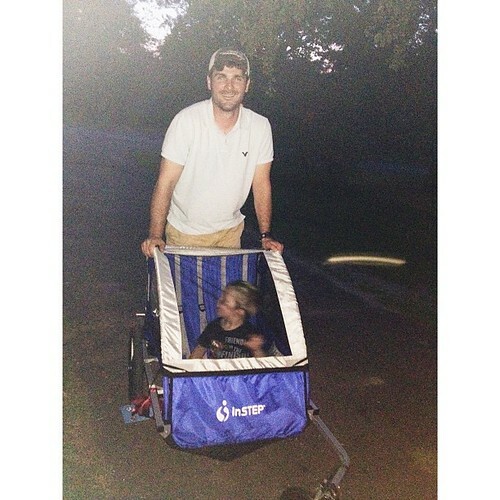 Do you think it's safe to put an infant carrier in the cart? ha! I'm kidding. How fun! I love the idea of a do-over birthday. you guys are so cute, I definitely think a birthday do-over was a good idea! enjoy your night! I love do-overs :) What a great gift - the look on Tony's face says it all. Running or lack there of.